Aluminum alloys are categorized by a four-digit code. The first digit indicates the main element or elements alloyed with aluminum to produce the specific grade. Products with the same first digit are said to be in the same series or family, described by a number followed by three zeroes or “X”s, such as 5000-series or 6XXX-series aluminum. Within the same series, products share basic characteristics and applications. 6XXX-series aluminum uses a magnesium-silicon combination as the primary alloying elements. Like the 5XXX-series, good combinations of strength and formability exist, but here an exposed quality surface can be produced without risk of Lüders or other bands affecting the appearance. The 7XXX-series grades feature some of the highest-strength aluminum-sheet alloys, but typically do not offer good formability at room temperature. Successful stamping may require forming at temperatures at or greater than 200 C. These products usually are riveted rather than welded, owing to the risk of weld cracking from a large solidification-temperature range. In addition to having zinc as the main alloying element, some grades also contain a combination of magnesium and copper. Both 6XXX- and 7XXX-series alloys strengthen following heattreatment. This allows for stamping a lower-strength product, which, following processing, converts to a higher-strength product for industrial applications. For example, in automotive applications, 6XXX grades achieve full properties after stamping followed by a paint-bake (curing) cycle of about 185 C for 20 min. An efficient scrap-recovery system maximizes the profitability of parts formed from these grades. When collecting steel scrap for recycling, stamping plants typically send all grades into one hopper. If done with aluminum stamping scrap, a significant loss in value would result. 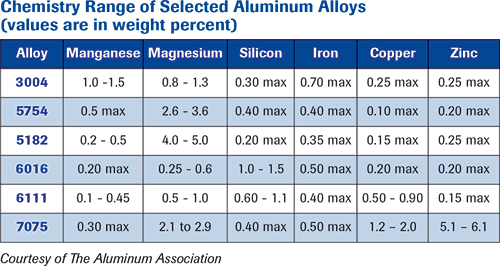 See the table, Chemistry Range of Selected Aluminum Alloys, for composition ranges of representative aluminum alloys. Compare the magnesium and silicon levels of the two 5XXX- and the two 6XXX-series products shown for an indication of why scrap segregation is important. We are all familiar with beverage-can recycling efforts, which work primarily because all can bodies consist of one of two grades, AA3004 or AA3104. Higher-strength alloys such as AA5182 are needed for lids, as they do not undergo the same forming process as bodies, and, therefore, do not have the opportunity to work-harden. Despite the higher magnesium content, AA5182 is considered to be recycling-compatible with AA3004/3104. Aluminum lines that melt and roll beverage-can stock typically only serve this market, and have optimized chemistry and processing accordingly. Significant quantities of scrap from other 5XXX/6XXX applications are not incorporated into the melt, since it will make the chemistry requirements of 3XXX-series can body material more difficult to achieve. Scrap segregation takes on increasing importance for manufacturers targeting automotive applications. Engineered scrap can encompass 40 percent of large panels—consider the window cutout of doors. In preparation for the 2015 F-150 launch, Ford installed a $60-million pneumatic scrap-handling system that returned scrap aluminum back to the producer mill, creating a true closed-loop recycling process. Scrap value increased by 50 percent after segregating by grade and producer, allowing for a savings of $80 million/year and ROI within less than a year. In addition to exposed applications requiring 6XXX alloys, some companies use these products on unexposed applications as well to facilitate scrap recycling, in spite of the higher material costs as compared with 5XXX.